As reported by Medical News Today, UC Irvine scientists have created an eight-layer, early stage retina from human embryonic stem cells, the first three-dimensional tissue structure to be made from stem cells. It also marks the first step toward the development of transplant-ready retinas to treat eye disorders such as retinitis pigmentosa and macular degeneration that affect millions. In previous studies on spinal cord injury, the Keirstead group originated a method by which human embryonic stem cells could be directed to become specific cell types, a process called differentiation. Results of those studies are leading to the world's first clinical trial using a stem cell-based therapy for acute spinal cord injury. In this study, the Keirstead team utilized the differentiation technique to create the multiple cell types necessary for the retina. The greatest challenge, Keirstead said, was in the engineering. To mimic early stage retinal development, the researchers needed to build microscopic gradients for solutions in which to bathe the stem cells to initiate specific differentiation paths. 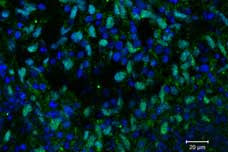 "Creating this complex tissue is a first for the stem cell field," Keirstead said. "Dr. Gabriel Nistor in our group addressed a really interesting scientific problem with an engineering solution, showing that gradients of solutions can create complex stem cell-based tissues." UCI researchers used human embryonic stem cells to create these retinal progenitor cells, which later developed into a three-dimensional tissue sheet. More than 10 million Americans suffer from macular degeneration, the leading cause of blindness in people over 55. About 100,000 have retinitis pigmentosa, a progressive, genetic disorder that usually manifests in childhood. "What's so exciting with our discovery," Keirstead said, "is that creating transplantable retinas from stem cells could help millions of people, and we are well on the way." The UCI researchers are testing the early-stage retinas in animal models to learn how much they improve vision. Positive results would lead to human clinical trials. The study appears online in the Journal of Neuroscience Methods. Nistor, Magdalene J. Seiler, Fengrong Yan and David Ferguson contributed to the effort, supported by The Lincy Foundation and private donations to the Keirstead group. Earlier last week, I was reading a report on Dr. Robert Langer’s keynote address from the recent ARVO meeting held in Ft. Lauderdale, FL, “The Future of Regenerative Medicine in Ophthalmology”, and thought that his idea of a prototype microchip or polymer implant, that contained pockets or drug reservoirs that could be selectively controlled or opened by a patient’s physician, in this case the individual pocket or drug reservoir opened by the application of a focused laser beam, could really be useful in treating AMD. Instead of monthly injections of anti-VEGF agents, a single implant containing multiple doses could be implanted and each dose activated by a simple ophthalmic laser beam upon need. Then, lo and behold, last Friday morning I received a news release from a company called On Demand Therapeutics, Inc., which, it turns out, holds the rights from Dr. Langer’s laboratory at MIT and spin-off companies, to develop just such a device. John Santini is the president of the new company. He is the co-founder and former president of MicroCHIPs, a company founded by Santini and Dr. Langer in 1999, to develop proprietary reservoir arrays that are used to store and protect chemical sensors or potent drugs within the body for long periods of time, based on the research and inventions derived from Dr. Langer’s MIT laboratories. In 1976, Dr. Langer and Judah Folkman, MD, a pioneer in anti-angiogenic research, devised a polymer material that released an angiogenic inhibitor. The agent thwarted neovascularization and stunted the growth of tumors in rabbit corneas. The research bore fruit when the U.S. Food and Drug Administration approved the anti-VEGF agents Macugen (pegaptanib sodium solution, Eyetech/Pfizer) in 2004 and Lucentis (ranibizumab, Genentech) in 2006. Santini, a former graduate assistant of Robert Langer, founded MicroCHIPS along with Langer and MIT colleague Michael Cima in 1999. He led the firm for 11 years, through several funding rounds, including a recent round resulting in nearly $16.5 million raised that took the total to $70 million. Santini has now moved on to head up On Demand Therapeutics Inc., a San Francisco-based MicroCHIPS spinout. In his ARVO address, Dr. Langer said the researchers' main dilemma in developing a drug release reservoir was designing polymers that could elute large bioactive molecules. Porous polymers enable timed and controlled elution of almost any bioactive molecule, regardless of its size. "These pores are large enough so that molecules, even of millions of molecular weight, can get through," according to Dr. Langer. Newer technologies show promise. For example, a prototype microchip device comprises tiny pockets or drug reservoirs. The application of an electrode dissolves a gold coating on the chip, allowing the drug agent to elute in a timed and controlled way. Such devices are being developed by MicroCHIPS for the treatment of severe osteoporosis through the delivery of an anabolic bone-building hormone, and also for continuous glucose monitoring for people with diabetes. Dr. Langer said that the chip (or drug reservoirs) may also have applications in retinal drug delivery. A physician-controlled retinal drug delivery technology would involve an implant with sealed drug reservoirs. The targeted application of an ophthalmic laser to open one or more of the wells to allow the release of the respective drug into the eye, could constitute a breakthrough, said Dr. Langer. ODTx was formed in May 2009 as a unique joint venture between MicroCHIPS, a developer of intelligent implant systems, and InterWest Partners, a leading diversified venture capital firm. ODTx leverages the intellectual property and technical expertise of MicroCHIPS combined with the ophthalmic domain expertise and financial resources of InterWest. The company has an exclusive, worldwide license to 60 issued patents and numerous pending applications related to ophthalmic on-demand drug delivery and related technologies. Typical retinal drug delivery procedures, such as for treating CNV (choirodal neovascularizaion, or “wet” AMD) require monthly intravitreal needle injections. Current implantable devices are largely focused on steroids and/or deliver sustained release formulations which have no mechanism for control of dosing, leading to significant side effects such as glaucoma or cataracts. In contrast, once the ODTx device is implanted during an in-office procedure, the ophthalmologist can control drug delivery by focusing a laser beam on one of the multiple sealed reservoirs. Administering a laser pulse creates a micro-opening in the device that releases the drug into the eye. Unactivated reservoirs remain intact until those doses are indicated. There is no need for monthly injections and the patient is easily maintained through regular follow-up visits and subsequent non-invasive laser activation procedures. Multi-reservoir devices have been fabricated and used in three in vivo feasibility studies. These studies demonstrated the implantation procedure, that the devices were well tolerated, and that both small and large molecule drugs could be released on demand when their reservoirs were opened by an ophthalmic laser. The company is now considering various opportunities, including venture investment and corporate deals with pharmaceutical and medical device companies, to quickly move products utilizing this innovative drug delivery platform into the clinic. In thinking about this innovative approach to providing on-demand drugs to the retina, I came up with a series of questions that will have to be answered before this invention can be comercialized and brought to market. Here are my questions – and I’m sure there are others – I look forward to your comments. 1. What size will the drug reservoir have to be to contain the equivalent of five or so 0.5 mg doses of, say, Avastin? 2. As “floaters” (small strands of clumped vitreous) can become annoying, what effect on vision would the reservoir have? Would it be implanted in the retina, or free floating? Would it be “visible” just sitting in the back of the eye? 3. Would a small puncture of an individual cell allow all of the drug contained within that cell to release, to become available to the retina? 4. How will the company distinguish between full and empty cells – perhaps by coloring the solutions? 5. Finally, how long will it take to answer all of the questions and obtain FDA marketing clearance? My guess is a minimum of three to five years. It seems that the Brits also want to use Avastin instead of Lucentis in treating AMD, and the UK’s cost-effectiveness body of NICE (the National Institute for Health and Clinical Excellence) is taking the first steps to appraise the off-label use of Avastin to replace the already approved use of Lucentis in AMD. As reported by Nick Smith of APM Health Europe, it appears that Lucentis’ high cost is beginning to effect the UK’s NHS and thus a look at the lower-cost anti-VEGF version, Avastin. Here, with permission of the publisher, is the latest story from Europe. LONDON, May 4 (APM) - UK cost-effectiveness body NICE is taking the first steps in appraising the cost-effectiveness of Roche's cancer drug, Avastin (bevacizumab) in off-label use for ophthalmology, on the instructions of Britain's Department of Health. NICE indicated to APM it has not yet concluded if such an appraisal is possible but, presuming it is, the likely end result of Avastin proving a lot more cost-effective than Novartis' Lucentis (ranibizumab) looks likely to put a dent in the sales of Lucentis internationally. Citing restrictions on what can be communicated in the run up to the UK's general election, NICE refused to expand on its exploratory findings but pointed to an earlier unheralded statement on its website. In short, this says NICE has been asked by the DoH to look at the feasibility of conducting such a study (the usual process) and, while the request is unusual, it is within its remit. Nice notes that it gave the green light to the use of Lucentis by the National Health Service in 2008 for use in age-related macular degeneration but also that read-out on head-to-head trials of it and Avastin in ophthalmology are expected late 2011 and 2102. NICE concluded that it will report back to the DoH, including the opinions of stakeholders it has garnered, in early summer. Speaking to APM on Tuesday, both Roche and Novartis said NICE had not yet approached them for an opinion on the assessment. Neither were positive on the move, with Roche pointing out clearly that Avastin was not indicated in ophthalmology and that even if the drug worked in "fundamentally the same way" the development of Lucentis, particularly its stronger binding properties, made it significantly different. Roche, via its subsidiary Genentech which developed Avastin and Lucentis, retains the rights to Lucentis in some markets including the U.S. and first quarter sales were worth $327 million, up a reported 27%. Novartis told APM it had been made aware of the instructions to NICE by the government but also that NICE had not indicated how it intends to take the issue forward. However, the company said it is "concerned" by the direction given by health ministers, given the "availability of a licensed and NICE approved treatment, ranibizumab." Novartis stressed the trial data supporting Lucentis' use and its NICE approval, specifically noting it had to come up with a special pricing scheme to gain the green light for NHS funding. On the issue of Lucentis versus Avastin in AMD trials, Novartis said these "will not deliver the robust safety data available for ranibizumab." Novartis did not specifically give an opinion on whether Avastin was safe in ophthalmology but stressed it was developed and approved as a cancer drug. Nevertheless this latest development highlights the problems faced by Novartis in Lucentis' relatively short history with the company needing to come up with various special pricing schemes to get it accepted in several markets. That achieved - even if margins may have been squeezed - with first quarter sales of $364 million, up 59%, the drug was beginning to move in the direction of the earlier big sales targets of some analysts. However, data published in Ophthalmology in December suggesting equivalent efficacy will not help Novartis and, given NICE's well-established international influence, a positive opinion on Avastin looks like it would at best dampen the upward sales path. Even ahead of this, many countries are already known to use Avastin in AMD - including some UK hospitals, as NICE itself acknowledges. From NICE's point of view, its earlier thinking that patients should be blind in one eye before being eligible for treatment in the other is one of the most derided decisions it has ever made.